27th Lancers perform "Blue Rondo à la Turk" in 1982. Among the several corps that featured "Take Five" are the 1979 27th Lancers, 1988 Bluecoats, 2003 Blue Devils and most recently 7th Regiment in 2011. A 1966 performance of "Take Five" by the Dave Brubeck Quartet. 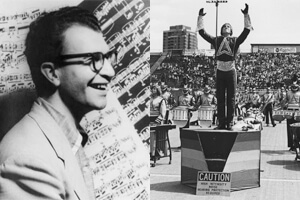 Brubeck wrote "Unsquare Dance" in 1961 in 7/4 time for his album, "Time Further Out." Clapping hands were an integral feature of the rhythm. Blue Devils, Jersey Surf and Troopers are among the corps that played the piece in the last decade. The following video clip offers a rare glimpse at a delightful dance that was produced shortly after the work premiered.